Our deepest sympathies are with Tom Hale and the family of Margie Haven. Public health officials are aiming to have new rules, training and reporting requirements in place for the start of the 2011-2012 school year to better protect student athletes from traumatic head injuries that can occur during sports and other extracurricular activities. I had a truly Edgartown winter Friday night last week, sitting at the Newes with a pint, surrounded by friends, listening to Michael Benjamin play a set of favorite tunes. 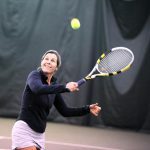 The Vineyard Tennis Center, Workout, and Spa hosted the Winter Classic Tennis Tournament on Saturday and Sunday. Curves of Martha's Vineyard, the fitness center exclusively for women, announced the addition of Zumba to its fitness lineup and a free one-week tryout. The Permanent Endowment for Martha's Vineyard is accepting applications for its spring grant cycle. A group of visiting town moderators opened the floor to discussion among themselves at a meeting at the Mansion House in Tisbury on January 15. The National Alliance on Mental Illness (NAMI) of Massachusetts is sponsoring a free Family-to-Family educational course for family members of individuals with a serious mental illness. The Boathouse Foundation, a philanthropic unit of The Boathouse Club of Edgartown, presented a check for $25,000 to the YMCA of Martha's Vineyard on January 13th. The Vineyard boys varsity hockey team played two games last week against two of the better teams in Division Two. Have no fear — burn season is here. 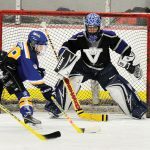 The Vineyard mite and squirt B teams from the Cape and Islands League took to the ice last weekend for the annual Ryan Mone Memorial Tournament at the Martha's Vineyard Arena. The Vineyard boys varsity basketball team entertained Bishop Feehan Saturday afternoon in a matchup of last year's Eastern Athletic Conference co-champions. The Martha's Vineyard Regional High School swimming club hosted Blue Hills Regional Vocational Technical School in the Island's first swimming meet at the new YMCA pool Monday. Why can they spoil the views with eyesore wind turbines? I do not understand why homeowners or small businesses think it is okay to erect wind turbines that can be seen for miles and are considered eyesores by so many people. Julie Robinson Interiors in Vineyard Haven hosted a reception on January 20, for Martha's Vineyard artists and craftspeople featured in the Sourcebook of Architectural and Design Elements Handcrafted on Cape Cod, Martha's Vineyard, and Nantucket. A front page photo published on January 20 of young violinist Tyler Shipway failed to identify the young musician on the right side of the photo. The Martha's Vineyard Fish Farm for Haiti Project continues its mission.